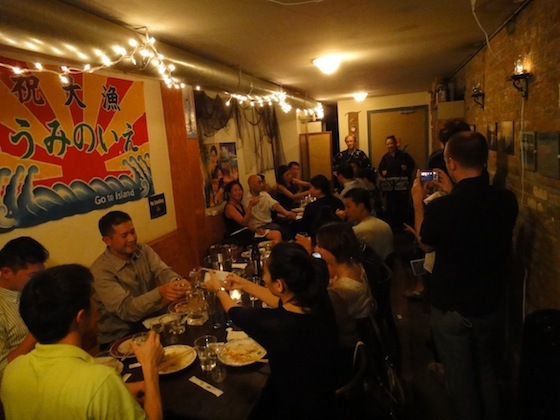 Last week East Village izakaya Uminoie held Okinawa•Awamori Nights to celebrate the unique culture of Japan’s southernmost prefecture. The two-night event fed and entertained sold-out crowds. 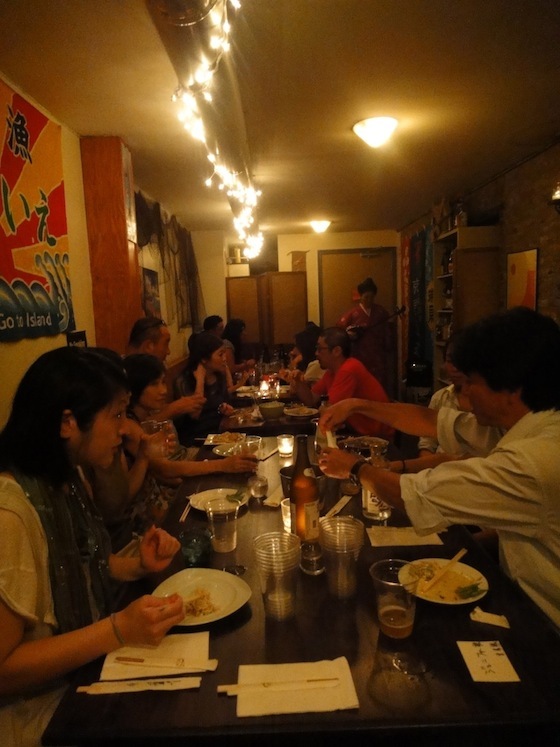 Fans of Okinawa – and people who knew nothing about the prefecture prior to attending – packed the tiny restaurant and sampled a buffet featuring Okinawa’s regional cuisine and three kinds of awamori, an Okinawan rice whisky. On a rain-soaked Wednesday night, Okinawa native Junko Fisher performed two sets. Dressed in traditional kasuri kimono, Junko played sanshin, the traditional three-stringed instrument of Okinawa, and sang Okinawan songs. She delight guests with her music, but she also gave background information on each song, providing us with a little history lesson. 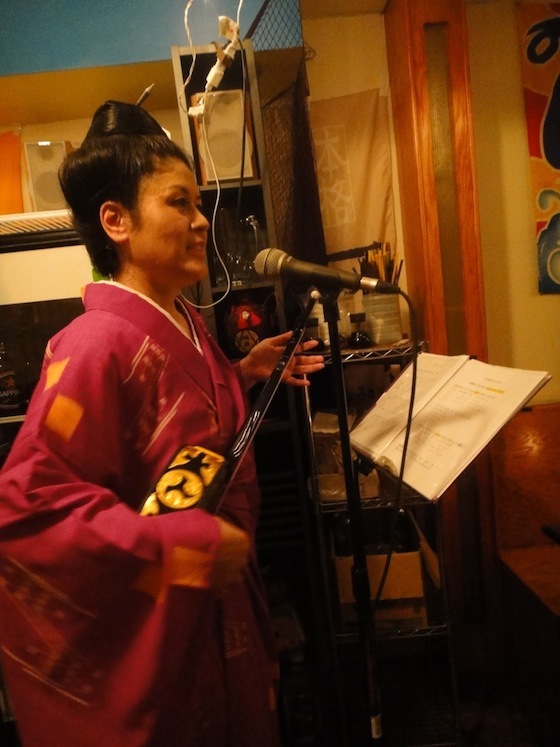 Junko teaches weekly Okinawan music and dance classes at Resobox. The next night we enjoyed the sanshin playing of two members of Ryu-Kaji. Saki Taguchi, who is originally from Osaka and not Okinawa, was joined by her student Graham. The duo played popular Okinawan folk tunes and even took requests, including a rousing rendition of “Shima Uta” sung by the crowd. Okinawa•Awamori Nights was the brainchild of Todo Todoroki, a part owner of Uminoie who also spearheaded a week of similar events in April. 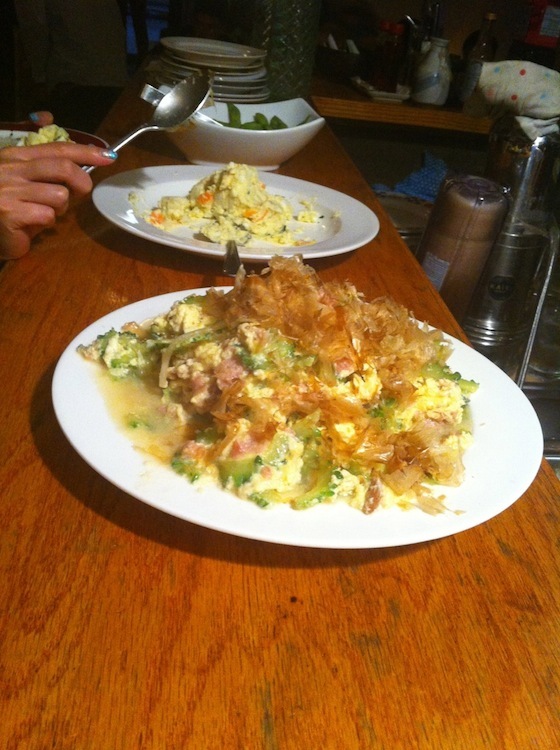 Todoroki has a special affinity for Okinawa, which is vastly different from his native Tokyo. Most people recognize Okinawa for its difficult role in World War II and with the subsequent US military occupation. But for all their hardships, Okinawans have managed to preserve their unique customs, culture, and language. Okinawa consists of 160 islands, many of which are uninhabited. Although Okinawa has been a part of Japan for a relatively brief time, the area has a rich history. Long before Okinawa was incorporated by Japan in 1879, the subtropical chain of islands was known as the Ryukyu Kingdom and shared a vigorous trade relationship with China. When the Chinese sent imperial representatives to the Ryukyus, they were entertained at Shuri Castle with food, drink, and court dances. Today Shuri Castle is recognized as one of the UNESCO World Heritage designated Castles of the Ryukyu Kingdom. Okinawa is the birthplace of karate and home to lively festivals, including Eisa, a traditional dance with taiko drumming; and the Naha Tug of War, which the Guinness Book of World Records deemed to be the largest tug of war in the world back in 1997. Like much of the rest of Japan, Okinawa has very little natural resources, but the prefecture is abundant with natural beauty. Because of its beaches and resorts, Okinawa is a popular vacation and wedding destination. Ecotourism is an important business, as visitors flock to tour the mangrove forests and to scuba dive and go whale watching. Much of the beauty of the islands is reflected in regional crafts. The Tsuboya neighborhood in Okinawa’s capital of Naha boasts kilns that have been producing pottery for hundreds of years. Okinawans also take pride in their textiles. Bingata is a traditional resist-dyed cloth that dates back approximately 500 years, bashofu is cloth woven from banana fibers, and in kasuri the fibers have been dyed to create patterns in fabric. Ryukyu glass and lacquerware are also big souvenir items. Regional cuisine is quite special. Goya champuru (which was served at the events), rafute, ashitebuchi, sata andagi, taco rice, and umi budou are just a few of the specialties you’ll savor in Okinawa. Okinawa soba is different from the soba found on mainland Japan, as it is made of wheat noodles instead of buckwheat. For more information on Okinawa, visit the website of Okinawa Prefecture. Check out my photos from Okinawa•Awamori Nights on Flickr. Keep in touch with Uminoie’s upcoming events by following the restaurant’s Facebook page. Sounds like a fantastic event! I would love go to this next time they celebrate. It also makes me really want to take a dance class!